After a hectic week, one usually looks for some leisure time to indulge in during the weekend. Here is something unique, extremely refreshing and rejuvenating, something different from the parties, pubs and movies that one usually dives into. Experience the beauty of nature in its pristine form - on the mountains! 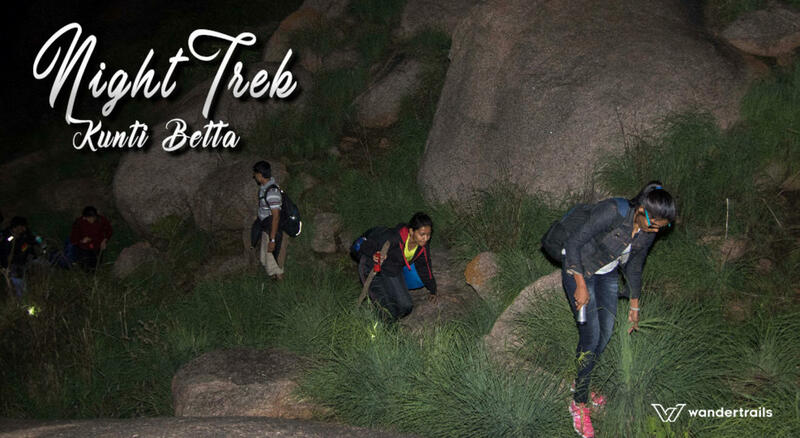 Here is a short night trek for you to one of the most picturesque mountains in Karnataka - the rocky hills of Kunti Betta. Located around 125 kilometres from Bengaluru, this is a perfect getaway from the bustling cities, breathe in the fresh air away from the stifling city crowds and revel in the peacefulness of the mountains. Enriched with a history connecting it to the famous Hindu stories of Mahabharata - the Pandavas and their mother Kunti, after whom the village and the rocky hills have been named, this trek becomes even more appealing and fascinating. With some extremely experienced guides, the journey begins from Bengaluru with a short three-hour ride to Ramanagara. Upon reaching the campsite Ramanagara, a welcoming change of scene greets you - with a quietness and freshness in the air at midnight. The trek starts from Kunti Betta base, a trail through the rocks, boulders and shrubbery growth that lies towards the base of the hill. Trust your host to guide you through the tougher spots as you trudge on to reach the summit. The walk is fairly easy though the rocks may look daunting in the darkness of the night. At the top, make the night exciting with a campfire and sharing stories. The history of the place and the hill would seem one fascinating topic for a bonfire huddle. As the dawn breaks the sky, look on as the magnificent views below slowly reveal themselves to you. The panorama, swathed in green and blue of the beautiful Pandavapura lake would have you scrambling for your camera, to immortalize this one sight for your travel diaries. Feast your eyes on the views before you start back down. The adventure ends here, with the excitement and fun still lingering in mind. You will start back to Bengaluru after a good breakfast. One cannot help but take one last glance back at the picture behind - the one that let you forget all worries and have a great time.